Halloween is a lot more fun with a big kid. First, there was the pumpkin carving. We got a little carried away and our jack o' lanterns were a rotten, bug-infested mess before the big day, but we had fun and Elise has the makings of a master carver. Then, there was the carnival at our friend Rista's school. Elise was willing to sit very still (for a very long time I might add) to have this beautiful princess crown painted on her forehead. After which she and Daddy sat down to enjoy a taste treat. We also joined in the Halloween parade in our former stomping grounds. 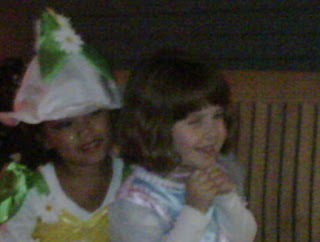 it was great fun to see all of our friends dressed up, and Elise even made friends with a fellow princess. Nothing like a vast expanse of grass for running around! The rain held off and Elise enjoyed taking her shot at the piñata (Though she was worried that it was "cheating" if the bandanna fell off of her face.) Here's the video footage! I cleverly managed to misplace our camera prior to the big day, so I will be relying on the kindness of friends for decent pics of our girl in her costume. But I do have a grainy cameraphone picture taken about 2/3rds of the way through the trick-or-treat marathon. As you might guess, the crowning glory of the day was trick-or-treating with Rista. For those of you who have not seen these two beauties in action, it is a treat watching them together. The two little princesses held hands up and down the sidewalks and stairs. They informed us that they are "brave together" which kept even the spookiest of houses from being scary. Candy is a big motivator. ;) In the end, they each ended up relaxing at each other's house, and the hostess shared her favorite treats from her bag. What a treat.